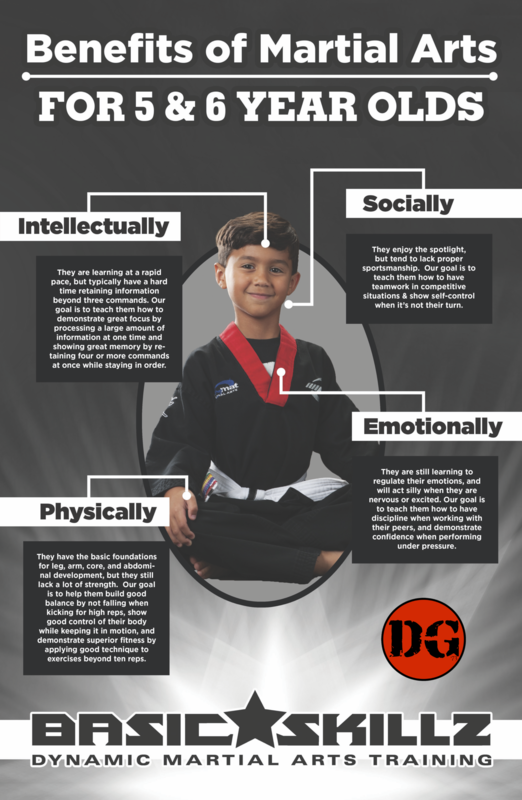 Want to know the science behind our 5 and 6-year old (Basic SKILLZ) Martial Arts program? • Physically- they typically do not know how to apply their muscles so they fall often when their body is in constant motion. Also, they have a foundation for leg, arm, core, and abdominal development, but they still lack a lot of strength. We expect them to initially struggle with multiple kicks beyond five repetitions. We also expect them to initially have sloppy technique when exercising. The goals for our program are to get them to perform high repetitions of kicks without putting their foot down, and perform static, active, and dynamic exercises for beyond ten reps with good technique. • Intellectually- they typically have a hard time retaining beyond three commands. They also have a hard time distinguishing between their left and right. We expect them to initially get confused when we ask them to do more than three things at one time. We also initially expect them to have a hard time distinguishing between their left and right when following multiple-commands. The goal for our program is to get them to retain three or more commands at once, and beyond. We will also help them learn how to perform various left and right combinations. • Emotionally - they typically focus on things that make them happy. They also have slow brakes when they are excited. We expect them to initially lose focus and shut down when they are not happy. We also expect them to lose control when they are over-excited. The goal for our program is to help them focus even when it's hard to do so. We will also help them control their body and their power, especially when they are excited. • Socially- they love to play with others, but are typically very competitive. We expect them to initially show weak sportsmanship when they participate in a competition. The goals for our program are to help them build good teamwork such as no cheating; don't get angry when they lose; and don't brag when they win. We cover one of the above skills per class (in order). During each class, we run a warm-up; deliver a mat chat about the skill; run two or three skill-building drills; and then we have them demonstrate the skill to earn their skill-stripe. They must earn all 8 skill-stripes to graduate to the next belt level. Once they earn their next belt they will continue to run through all 8 skills earning their skill-stripes with more challenging curriculum as they advance to each rank. They graduate to the Core SKILLZ program after they have successfully completed all 9-belt ranks of the Basic SKILLZ program. 1. FOCUS - Punching and kicking a pad that is thrown by an instructor standing one-step away from their side. They must be able to punch, and kick, a pad four times in a row in to pass. 2. TEAMWORK - Holding a kicking target for their partner while their partner does ten kicks. They must be loud while counting their partner's kicks and hold the target tightly to pass. 3. CONTROL - Stopping their body at attention position after running forward when an instructor says, "stop." They must be at attention in less than three steps after the instructor says stop to pass. 4. MEMORY - Demonstrating the three stage 1 blocks and three stage 1 strikes from memory. They must show the proper chambers and ending position for all the moves in to pass. 5. BALANCE - Executing five front kicks without putting their foot down in between each rep. They must show full execution and retraction while keeping their knee chambered at belt level or higher to pass. 6. DICSIPLINE - Demonstrating how to properly sit, take a knee, kneel on both knees, and stand at attention without moving. They must hold each position for no less than five seconds. 7. FITNESS - Holding each static leg, arm, abdominal, and core exercise. They must not lose technique or else they must start over. They must hold each exercise for no less than ten seconds to pass. 8. COORDINATION - Performing left and right punching combinations on the mitts. They must hit the mitt with proper technique and with the proper hand five times in a row to pass. As you can see we take Martial Arts training to a whole new level! We use basic elements of traditional Martial Arts curriculums to build skills that are appropriate for 5 and 6-year olds. This means that your child will learn and grow at a pace that is not too easy, nor too challenging. The best part is the Basic SKILLZ program will equip your child with skills that they will utilize in every area of their life!